Against popular belief, braces aren’t just for kids and teens. In fact, according to Delta Dental, approximately one million American adults wear braces! Many of our adult patients had braces as a child, but forgot to wear their retainer. Others never had braces to begin with and are now ready to take care of their smile insecurities once and for all. High Tech Metal Braces – You are probably most familiar with classic metal braces – however these braces have undergone some notable technological advances in recent years. 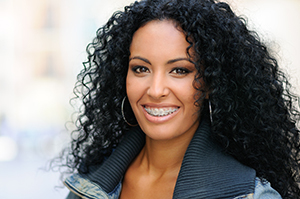 Today’s metal braces are smaller, use fewer brackets, and use thinner, more effective wires. Though metal is still the most efficient bracket material, brackets are also available in tooth-colored ceramic and clear plastic. Additionally, bands are available in neutral colors to minimize the appearance of the braces. Clear Aligner Therapy – With clear aligner therapy, patients can straighten their teeth with an easy-to-use, removable plastic tray. A series of trays are prepared by your orthodontist to progressively shift your teeth into their ideal positions. Clear aligner therapy one of our most popular orthodontic treatments for adults. Mini Orthodontic Implants – Pointe Dental Group offers mini orthodontic implants, also known as temporary anchorage devices (TADs) to assist in orthodontic treatment. In some cases, TADs are inserted into a patient’s gums and bone to act as an anchor for orthodontic applications. TADS are especially helpful for patients with missing teeth. If you were to get braces as an adult, which kind would you be most interested in? We’d love to hear your thoughts in the comments section! This entry was posted in Orthodontics and tagged Adult Braces, Orthodontics, Pointe Dental Group. Bookmark the permalink. Follow any comments here with the RSS feed for this post. Both comments and trackbacks are currently closed.